The S60 Digital DJ Workstation is a dual USB player and a high performance mixer in an elegant all-in-one design. Set up of the S60 is easy and fast because you don’t need to waste time connecting cables. You just need to bring the S60 and USB storage device. It’s perfect for DJs who work events, for clubs that need to be able to dismantle their system quickly, and for any other DJ on the move. Moreover, the S60 is also is a MIDI controller that can fully control any DJ software. The comprehensive MIDI compatibility all 94 control elements can be applied as a MIDI control device. In this digital era, USB devices have become the most convenient way to store collections of music. S60 supports external USB mass storage devices. Connect an MP3 player, thumb drive, or hard drive for easy access of up to 255 folders, each of which can hold 999 files in MP3/WAV format. Download free VOXOA TUNEBOX software to make reading and searching files quicker and easier. The VOXOA TUNEBOX scans all music files in your USB mass storage devices and then creates a database file by which you can quickly locate files in your music library. 4 memo points can be saved per track for Hot Cues and Loops. The S60 can store your Hot Cues and Loops on any audio track and recall them later when that track is cued in the CD drive. The number of memo points is limited only by your USB memory capacity. This memo function can be used like a mini sampler for vocals, stabs, or breaks, adding a touch of creativity to any DJ set. VOXOA TUNEBOX software makes reading and searching files much quicker and easier. The VOXOA TUNEBOX scans all of music files in your USB mass storage devices and then creates a database file by which you can guickly locate files in your music library. Music can be played alternately from two decks using Relay play. The players can provide automatic, sequential playing tracks one after another from both decks. Linked with a compatible mixer, the Fader Start Play function makes the mixer’s fader perform back cue and quick start functions. The S60 supplies the DJ with four different types of on-board DSP digital effects, including Echo, Flanger, Filter and Skid, to enhance creativity and performance. Also, effect parameters Time and Depth can be adjusted independently via the jog wheel. A 100mm linear high-precision slider gives DJs total control and ensures that the tempo adjustment is easy and accurate. The range of tempo +/- 6%, +/-10%, +/-16% and -100% can be assigned to the Tempo Control slider. The Key Lock function locks the pitch of the track even when you adjust the speed of the track. You can speed up or slow down the beat without any noticeable difference in vocal and music pitch. Two decks can share a single external USB mass storage device from just one USB device. DJs don’t need to have several USB storage devices for different players and can easily manage their music resources from one storage device. Two large and bright displays provide clear and easy-to-read information during DJing. The information includes BPM, music name, effect's parameters, etc., to help DJs comfortably manage and control music in a dark environment. 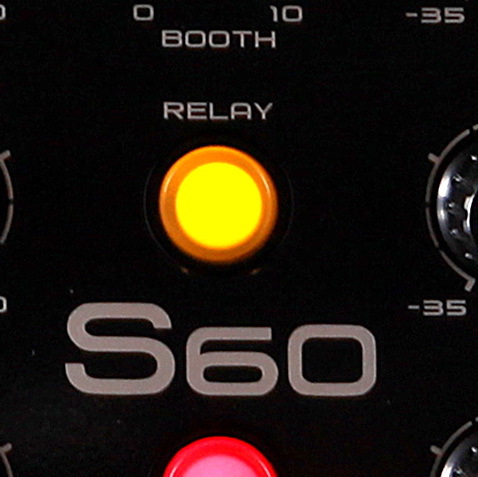 S60 is a standard mixer with two line/phono inputs and two microphone inputs. S60 includes a sound card with balanced and unbalanced output, so DJs can simply connect to the speaker or headphones and start the fun of mixing and DJing.